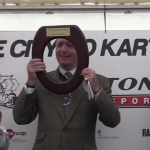 Over the last 21 years I have been lucky enough to be involved in some very glamorous and exciting karting events. Race Directing the Daytona 24 Hours on the Race Of Champions Circuit on the pitch at Wembley Stadium was a highlight, as was entering an endurance race with Tom Cruise. However my privileged viewing spot from Race Control as Race Director at the Red Bull Kart Fight Final on Saturday was a career highlight. 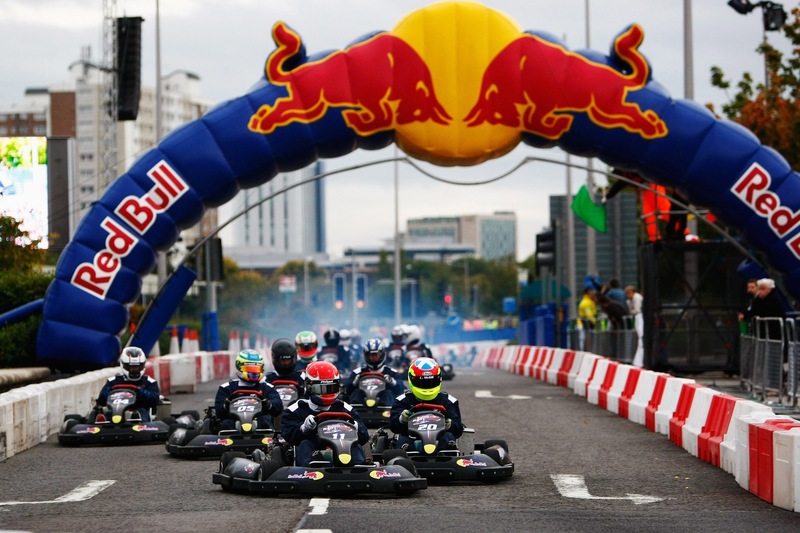 Seeing the crowd of 5000 motorsport fans completely caught up with the excitement of the epic three way race between Bradley Philpot, Liam McGill and Jack O’Neill in the Red Bull Kart fight’s Grand Final in Cardiff was a first. I don’t believe that there has been an attendance figure like it for a kart race. Lots of the fans were originally there to see Mark Webber driving the street circuit in his Red Bull Racing FB7, but once they saw how exciting the karting was, they were hooked. 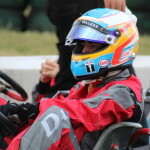 After a series of heats and an exciting B Final, the top twenty drivers raced over 8 laps of the unique 1350 metre street circuit in Daytona’s Dmax karts. With Philpot stealing the lead from second on the grid before the first corner, nearly throwing the whole race away with a big slide at the third corner, dropping back to third, then back to second, then out braking himself and Lee McGill on final bend, the first half of the race was exciting enough. Then a midfield runner clipped the barriers on “Crash Corner”, and was himself collected by two other karts going flat out. This pushed the barriers across the opposite lane and straight into Philpot’s kart. Luckily the wraparound bumper system on the DMax kart was able to cope with the collision with the water filled barrier – and the marshals were able to rebuild the corner within only one lap under full course yellows. The crowd enjoyed another couple of laps with the top three drivers glued together before a local waved yellow at Crash Corner meant that the drivers had to slow down throughout the Roald Dahl Plass section. 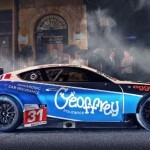 As they rejoined the road in front of Race Control and headed onto the back straights, Philpot saw the Green Flag being waved at the entrance to the chicane a second or so before race leader McGill saw it and this gave him the minuscule advantage needed to out accelerate McGill down the back straight and into the braking zone for turn 9. 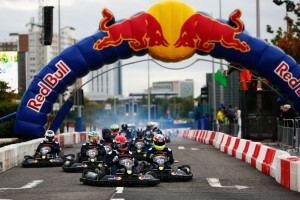 One lap later, Philpot punched the air in triumph as he took the chequered flag and become the UK’s first ever Red Bull Kart Fight Champion. To see 5000 people clapping and cheering the top drivers as they entered Roald Dahl Plass was a delightful sight – as was watching Mark Webber head out for another demo lap in his F1 car. Once we had completed the post-race administration in Race Control I headed down to the Pits and the Drivers’ Lounge to see what the drivers thought of the event. I was so pleased to be stopped by so many drivers who wanted to tell me that they had enjoyed the best day of their lives. 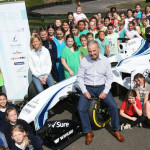 Even drivers who had failed to qualify for the Grand Final had enjoyed feeling like an F1 driver in front of the crowds. 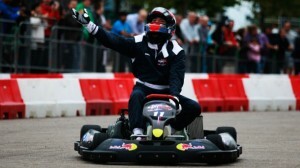 Well done Red Bull for showing everyone just how exciting karting can be. But as I headed back to the Winnibago to upload the days racing results to Red Bull’s website, I also received a text from a member of our team who was reporting in from Berlin, where he had been running our two-seater Thunderkart for Vodafone Germany – who had arranged for some of their VIP prize winners to enjoy being driven in the two-seater by Vodafone McLaren Mercedes driver Jenson Button. He was happy to report that the day had gone equally well and that Jenson had singed the kart… luckily he meant signed! The next text was from the Team Daytona crew running Ivan Taranov in our Formula Renault at Thruxton, giving us the great news that he had finished 10th and 12th in the double header race meeting – out of a field of 18. Just another Saturday for Daytona… oh and in case you were worried, we also provided racing to a total of 450 drivers at Daytona’s circuits in Esher, Milton Keynes and Manchester!